My first impressions from autumn are quite bitter as it means that the summer is definitely over, there is less daylight outside and it starts to be colder. Fortunately, autumn has also its advantages! I actually love long evenings spent with my books or good movies, with a cup of warm tea or my beloved mate and some yummy cookies such as these ones! 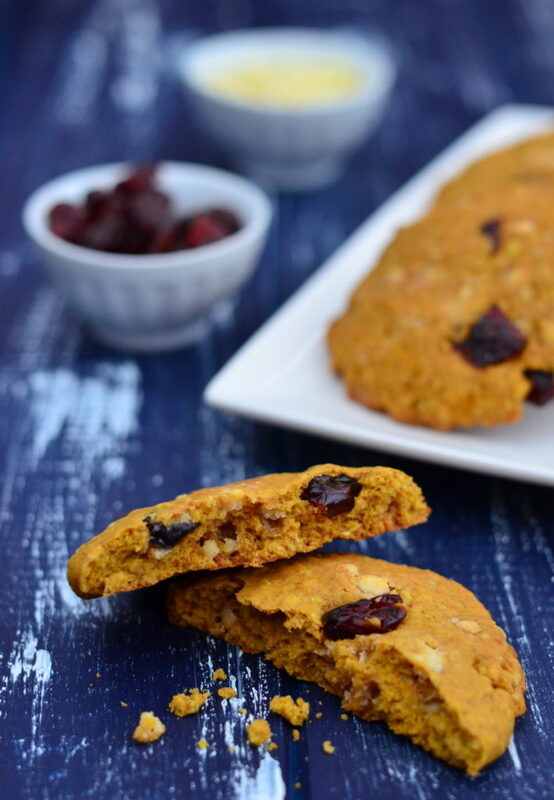 Soft and chewy pumpkin oatmeal cookies with white chocolate and cranberries melt in your mouth and have a nice autumn and winter smell thanks to spices used (cinnamon and nutmeg). Those are the best cookies I have ever done and right now my favourite cookies and I can have one each day and cannot get tired of those! 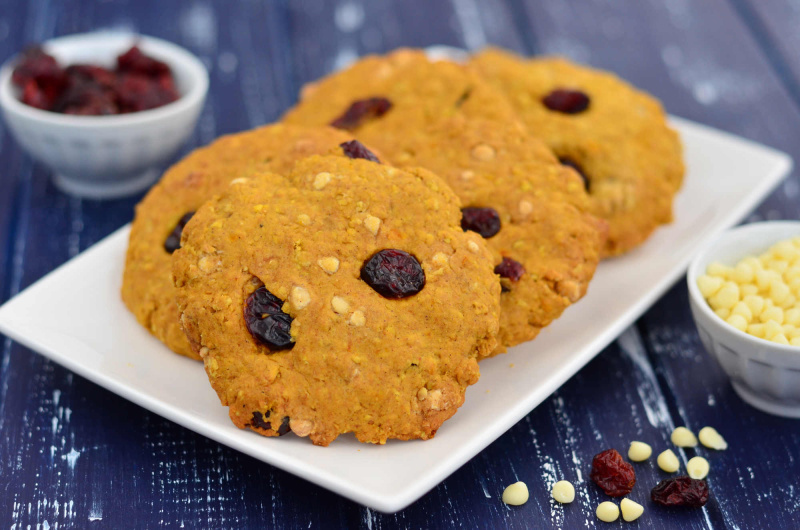 Soft and chewy pumpkin oatmeal cookies that melt in your mouth and have a nice autumn and winter smell thanks to spices used. Preheat oven to 180°C (160°C fan). Line baking sheets with parchment paper or silicone baking mats. In a large bowl, beat butter with sugar and date honey / molasses until combined, then beat in the egg. Add pumpkin purrée and vanilla essence, whisk until smooth. In a separate bowl, combine flour with baking soda, baking powder and cinnamon, nutmeg and salt. Fold in the oats. Gradually fold the dry ingredients into the wet ingredients until all combined. Fold in white chocolate and cranberies. Drop about 2 tablespoons batter per cookie on the baking sheet and gently flatten. Bake for about 15 minutes. 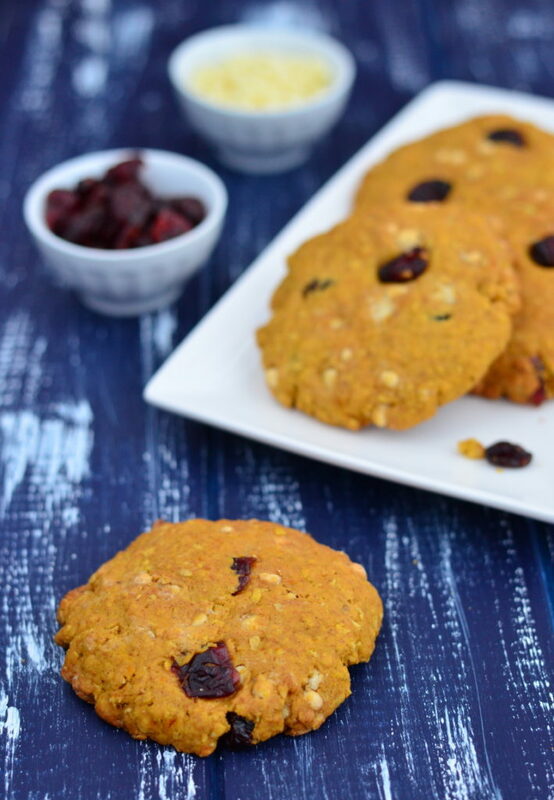 For gluten-free option, be sure to use gluten-free rice flour, gluten-free oats and gluten-free baking powder. What is your favorite goods to bake with pumpkin purée?